Dream Paris is the second in a series of books, following on from Dream London. The book ditches most of the characters from Dream London, with only two (that I noticed) reappearing. Dream Paris is the story of Anna, a teenage girl living in the slowly redeveloping ruins of London, which has only just re-established its reality after a takeover attempt by the Dream World. Her parents are absent, having marched into the parks at the end of Dream London, while Anna only narrowly escaped from the march. She's coming to terms with life on her own, looking after lost and vulnerable neighbours from time to time, and vaguely looking forward to passing her A-levels and moving on to university. Dream London has not passed without leaving some aftereffects behind. People take an undue interest in the social lives and virtue of women. Social mores have reverted by a generation or two (in Dream London, women were either housewives, whores, or, much more rarely, femme fatales), so Anna is not entirely surprised when a social worker shows up at her door, tasked with taking her into care. Anna's fortune foretells that she will meet her mother in Dream Paris. The British government has an interest in revisiting the Dream World, as the incursion into London has left Britain reeling. They send Anna on her quest, accompanied by a soldier / bodyguard. Dream London, if you haven't read it, is a mesmerising, evocative novel. Surrealism and dream logic intermingle effortlessly with an adventure story. It's a novel that reminds the reader of Dark City, of Terry Gilliam's Brazil. It's very archetypal, with patriarchical gender roles and a strong sense of location / London. Dream Paris, by comparison, is different. This time, too, there is surreal dream logic at work. The plot successfully balances the unpredictable nature of crazy dreams with the predictable shape of a regular story. Having a good structure with plenty of thrills makes it satisfying to read. Once again, there is also a strong sense of location. Paris is a different city, with different archetypes. Dream Paris is caught up in perpetual revolution. Eiffel Towers spring up everywhere and need to be repressed, while La Terreur and Madame Guillotine lurk just around the corner. Dream Paris stands up to reading on its own. It is a slightly superior novel to its precursor: Dream London made the reader feel like being sucked further and further into a dream. It was a sinkhole of surrealism, a huge credit to writerly craftsmanship, but, towards the end, it was so surreal that the reading experience stopped being pleasurable and started feeling more than a little nightmarish. Dream Paris, on the other hand, is set in an established Dream City. It is not trying to take over real Paris. There is less of a sense of spiralling, exponentially growing surrealism, as this city is more or less set in its ways. People are still shaped by the Dreamworld, but citizens here have lived their entire lives in Dreamworld: they are not brutalised by a shifting reality. Dream London turned women into whores, ethnic minorities into primitives. It did this, fairly rappidly, to people who were modern Londoners to begin with. Dream Paris may be full of iconic characters, but they have grown into their roles over their lifetimes. They have more agency, are less the victims of a traumatic invasion of their psyches. Dream Paris is full of interesting, quirky ideas. Scary clowns, porcelain dolls, sinister banks, edible duels, integer bombs, non-continuous mathematics, sexism and morality... it's a novel that positively fizzes with originality. If you enjoyed Dream London, I think you'll love Dream Paris. 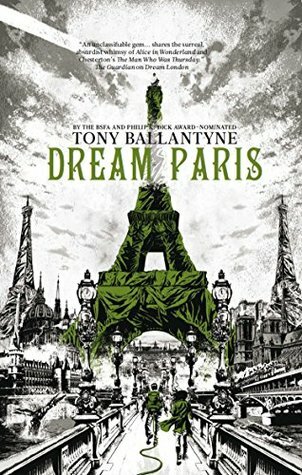 If you found Dream London interesting, but not quite to your liking, you will probably enjoy Dream Paris more, And if you haven't read Dream London, I would recommend it, and recommend Dream Paris more.